The justice system is just a system, not a just system. Sentenced to fifteen years in prison for a crime he didn't commit, Ethan Rafferty has one thing on his mind - payback! With his time up, the ex-con is free to pursue his mission of revenge. The District Attorney, Mariana Clark, who, during the trial suppressed evidence that would've exonerated him, is the focus of his vengeance. Intent on making her life miserable, Ethan employs a variety of tactics to antagonize and torment the woman. Unable to retaliate through the courts, considering her role in the previous trial, Mariana decides to fight fire with fire. Soon, their feud escalates to a point where neither imagined it would go. Which one will prevail, Ethan or Mariana? Who will win? Can either? Or, are both of them bound to a destiny produced by a Miscarriage of Justice? 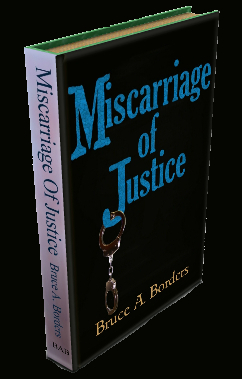 “In Miscarriage of Justice by Bruce A. Borders, Ethan Rafferty clashes with Marianna Clark. 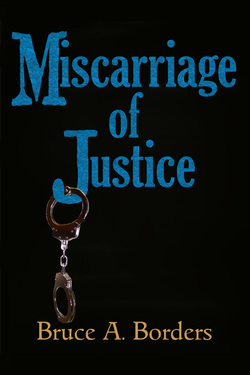 Ethan has been imprisoned for fifteen years for a murder he didn’t commit. District Attorney Marianna Clark, keen for victory in her first major case, found evidence that he was innocent but still pressed for a conviction. Ethan, working as a carpenter and spending little, has squirreled away a modest fortune, and he intends to spend it pursuing revenge on DA Clark, who caused him to lose not just his liberty but his wife and two young sons. Marianna receives one of hundreds of notifications that a prisoner she prosecuted has been released but, for once, she doesn’t toss it in the trash: Ethan Rafferty is a name she remembers vividly. Ethan dismisses the obvious forms of vengeance, such as killing her, burning down her house or targeting her family; he has no intention of being caught. Marianna relaxes as the weeks pass, but Ethan has learned patience the hard way. Available as an e-book at Amazon, Barnes & Noble, Sony, Apple, Kobo, Diesel Books, Baker & Taylor, Smashwords and more. Print edition available at many online retailers and on this site at The Bookstore.